Come Friday night, MacGyver will be airing the tenth episode of season 3 and it is a Matty Webber showcase like no other. Earlier this season, we learned via a file named Dragonfly that this long-secretive character has a husband named Ethan. Now, we’re getting to see so much more of his story. Ethan has spent the past several years undercover for a mysterious organization known as S-Company, but what happens when information leaks that there’s a mole in their midst? Can Matty and the Phoenix Foundation find a way to extract him before his life ends? These are the questions that this episode looks to answer. CarterMatt – When were you first approached about this idea of Matty having a husband that nobody else knew about? We’ve talked in the past about Matty being the keeper of secrets, so when did you find out about this one? 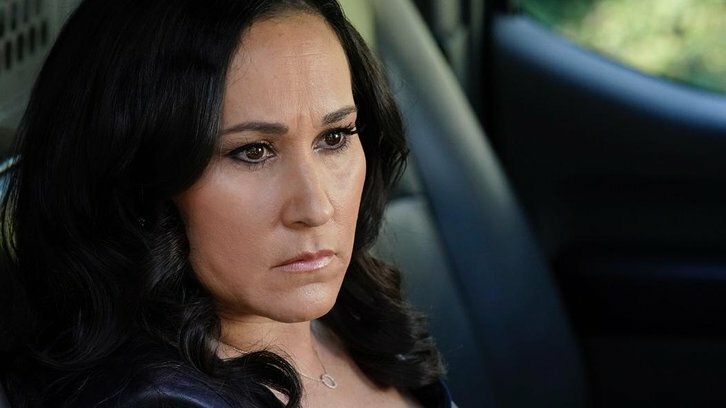 Meredith Eaton – I know that they had been wanting to explore Matty’s past and give a little bit of a peek behind the curtain of what makes her tick for a while. I think what they wanted to do was first establish Matty as a matriarch to some of the Phoenix heroes and then once that was established and people realized that Matty has good intentions — you never really know entering each episode — we could move in this direction. Early on this season there was talk about Matty having a husband so I knew a little bit, but then it sort of went away and I found out when I read the script for the Dragonfly episode. That was when I was like ‘oh! okay’ and it was solidified. Did having this bit of information change at all how you played the character? Did you approach anything differently? I think it just added a layer for me in terms of my intention and why Matty is who she is. It definitely brought some information to light for me; it added a lot of different crayons for me to color with. I’m very in-charge and I don’t personalize things as Matilda Webber, so it added a vulnerability that I never had an opportunity to show before. I had to figure out how to do that but then also not be vulnerable because Matilda Webber is never vulnerable in her occupation. It was challenging and exciting and I was so happy to be able to show some different dimensions. I think one of the reasons why MacGyver is so attractive as a show to a lot of people is that it mixes this action and humor with the softer-more personal moments with this group that has become a family. Like you said Matty is someone who doesn’t often let her guard down, but are some members of the team going to be able to get through to her after she learns that her husband is in danger? Yes. In particular, Mac. The Matty – Mac relationship is really important to me and it becomes really important to MacGyver. What the audience is going to see is a deeper understanding that Mac has of Matty’s private, more personal struggles and his epiphany of her having to deal with things behind the scenes while he’s been dealing with his own similar struggles with his father. That’s a real parallel and it could become a real bonding moment between the two characters. Want are you the most excited for viewers to see from this episode as a whole? I’m excited for people to see different sides of Matty. I’m not just the boss of the Phoenix Foundation; I’m also a person and there is a humanistic quality to her. She’s loved and she’s lost and there’s a deeper pain that she’s been suffering from quietly. Some of that motivates her attitude and her perspective on things. The writers have done such a beautiful job here because I think back to my very first episode on the show when I’m interviewing Mac and I’m saying to him ‘I’ve lost operatives and I’ve seen what this job can do to people.’ In looking back now, realizing her own husband had to go into the field and she lost that relationship with him, you see the realism of the type of job that they’re involved in, and how that plays into the person that she is. Related Content – Be sure to secure some more information on the next MacGyver episode right now!